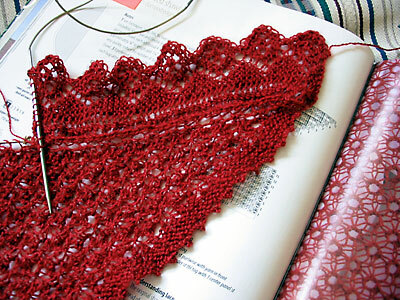 I’ve decided I dislike lace edging, finding it shifty and deceptive. You bind off the main body of the shawl, thinking you’re almost finished, and then find out you’ve really only done 2/3 of the knitting. Much muttering ensues about where the shawl can stick its needles. On the upside, Prentice #2 has been bound off and tossed into the wash pile for blocking. I’ll get around to blocking it and sewing on the notions whenever I feel like laundering a blanket, two sweaters, some handwarmers, several pairs of socks, two hats, and several scarves. There are now only 15758 ahead of me in line, which puts me 228 people closer to Ravelry. Woo! CogKnition posted this on August 12th, 2007 @ 10:40am in Unfinished Objects | Permalink to "On Edge"
I’m just poking around ’cause I am thinking of trying your Quinn bag for my next project (first time cabling)…I am also on a Ravelry watch. Hope to see you there one of these days! Your shawl looks awesome, btw. I hope I can do something that intricate one day…currently working on my first shawl, which is going v e r y s l o w l y, but getting there. Thanks for the Quinn pattern, and I will be making a contribution once I actually get organized to start the bag! The lace is beautiful, though, isn’t it? And the color rocks! Have I not been paying attention around here, or have you not told us what yarn that is?